When you're going away on holidays, packing is always such an issue. You need to pack enough for days or even weeks but you also need extra room for the amazing things that you'll buy. I can usually pack my make up quite easily as I like to reach for multi-purpose products. Clothes are always a difficult decision as you need to be practical as well as a fun. I find that haircare is easy. You don't really need a lot of products to be able to create some lovely (and practical) hair styles. If I need to bring shampoo and conditioner, I'll normally skip the conditioner and just bring a hair mask instead. When it comes to a hair oil, I prefer to pack an oil that's multi purpose and that can be used on both my hair and skin. There's a lot of oils around but my favourites are argan or macadamia oil. Because my hair is long and is a pain to wash, I try and get away without washing my hair for as long as I can (anywhere between 5-7 days). It took me quite a few months to "train" my hair to not feel gross between washes, but now washing my hair only once or twice a week is easy. The trick is to not overload your hair with too many products. I normally will only use an oil and a leave in conditioning spray to stop my hair from getting too oily and lank. If I'm going away, I'll normally skip the conditioning spray. I find that a hair straightener is the best tool to bring because you can both straighten and curl your hair with it. 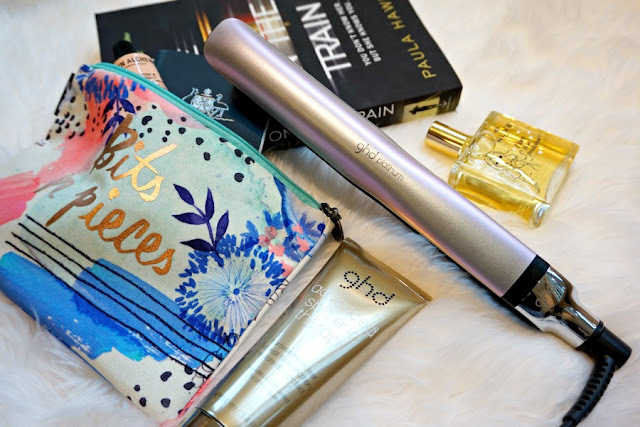 I really love the ghd Platinum Serene Pearl Styler. * This is a limited edition straightener from their Azores collection. Not only is it so beautiful (the pearl duo chrome colour brings up shades of purple and pink) but it has some cool James Bond features. It contains "tri-zone" technology that has 3 sensors on each plate to maintain the correct temperature. One of my favourite features about this has to be the chime that goes on when you turn it on and then it chimes again when it's ready to use. It also comes with a heat resistant mat which also turns into a bag so it's perfect for travelling safely with. I like to use it at home because children ALWAYS will interrupt you when you're busy doing your hair and it's nice to be able to put it on the mat and not have to worry about it burning the surface that it's on. 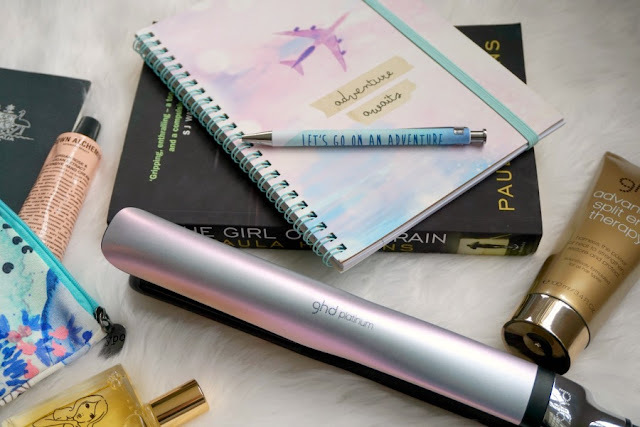 For added peace of mind, it also automatically turns off after being unused for 30 minutes, so you never have to worry about your straightener being left on (which is perfect for a worrier like me). 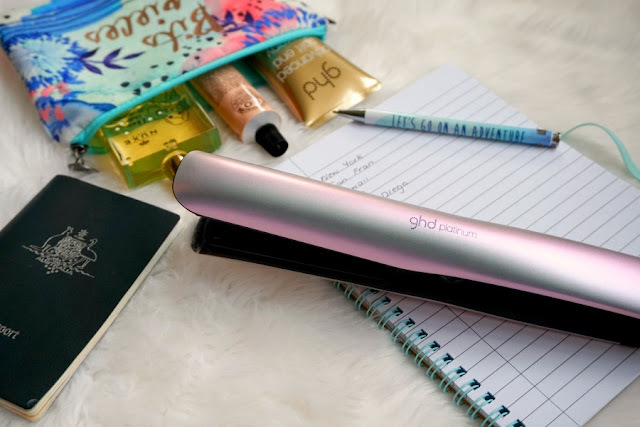 If you're going to curl your hair with a straightener, then make sure that it has curved plates, otherwise you won't get those effortless curls. When I'm away I normally will keep my hair down for the first 2 days and then put it up until I'm able to wash it. If you're visiting a humid or a windy place, then keep your hair out of your face by either pinning it back, braiding your fringe or using a headband. Once your hair is starting to feel oilier, go for a rockstar messy high pony or a messy topknot. Both are easy to do and you don't need a lot of products to do both styles. I like to use my fingers and tip my hair upside down to get volume and added thickness. A messy ponytail also looks really cool when you have slight waves through your hair. It adds to the effortless vibe. I also love a classic side plait for a cute hairstyle that keeps my hair out of the way. I love using small clear hair ties when I do braids and plaits as it looks cleaner. If you're wanting to pick up the ghd straightener, then buy it asap as it's limited edition. You can purchase it from the ghd website here, otherwise you can also purchase it from Ry.com.au and Adore Beauty (both online stores do after pay too!). 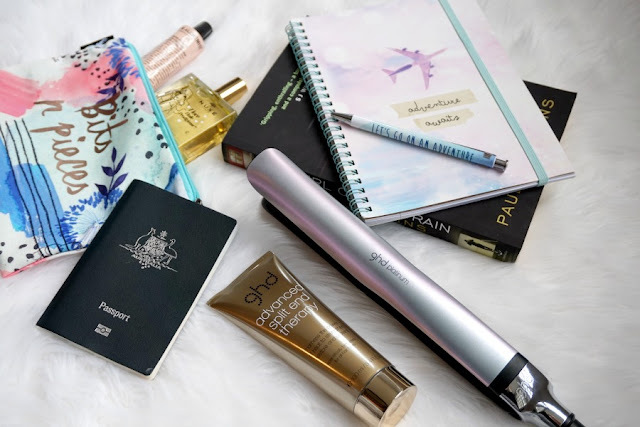 Are you an over packer or do you pack minimally? 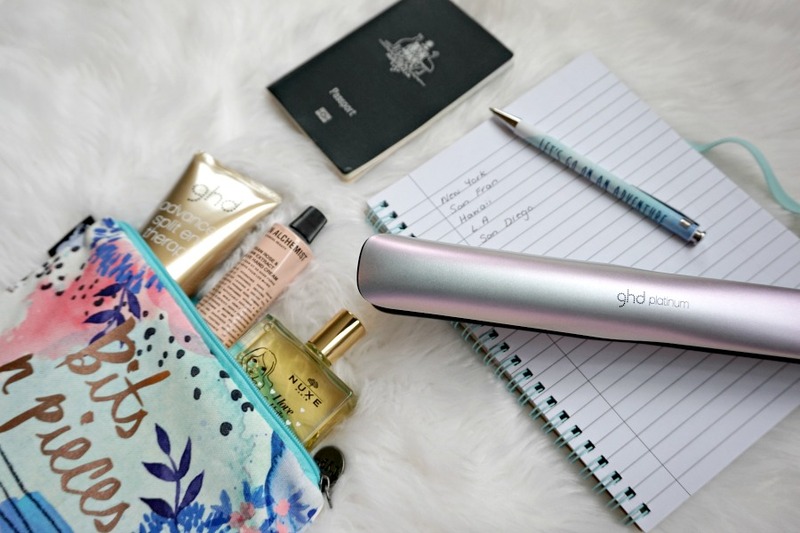 I love taking my hair straightener with me when I'm away. I don't even know what I bring with me, usually minis of things like hairspray and S&C. But I would probably have a whole packet of bobby pins and hair ties haha. You will also need some hair brushes too! 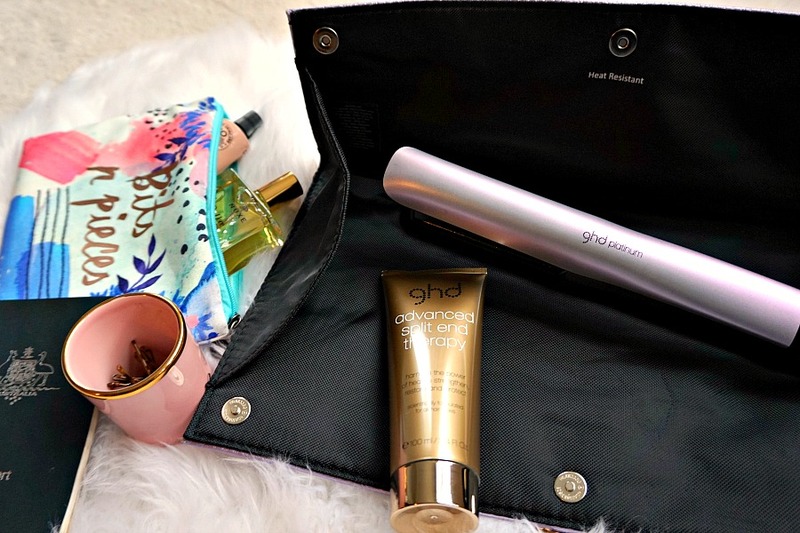 Taking so many things will slow you down, but of course you will make your beauty a priority and I am sure these products are helpful for that purpose. Thanks for sharing your post.